Amazing timing. When I wrote yesterday’s post I wasn’t planning on making these public. I was going to post privately. But after encouragement from a friend who started her own hilarious blog, I proceeded to spend more than two hours being convinced by Pink Floyd to ‘tear down the wall’. So here they are. 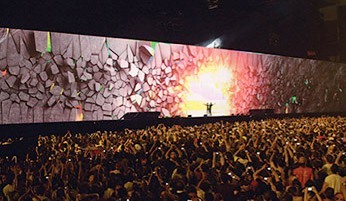 As the concert goes on a crew dressed in black slowly builds a gigantic wall across the stage brick by brick until it is 35 feet high and more than 200 feet wide and completely blocks the stage from the audience. You quickly realize the message is not just about war between nations but war between people and battles we face in our own daily lives. Our whole life is a wall built brick by brick of our experiences stacked one on top of the other and side by side. Do the walls protect us or trap us? Do they keep us safe or keep us isolated? Do they free us from perils the world or do they blind us to them? Do we even know the walls are there? Just as you are getting sucked deeper into the metaphor the crowd begins to cheer ‘TEAR DOWN THE WALL!… TEAR DOWN THE WALL!’… And suddenly a 100×35 foot section of the wall collapses to the ground and reveals the stage again. It is a challenge. Look at your life and the world around you. Is it possible to transcend the walls?